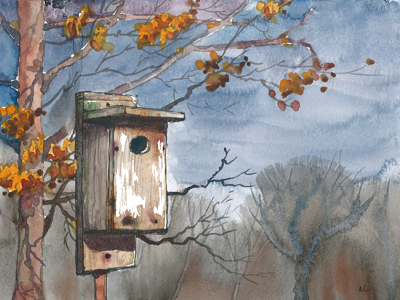 Weathered Nesting Box Watercolor – Let's Paint Nature! Shelter, the defense against elements. I say it’s from what’s left behind. This watercolor was done from a picture I took a few years ago. I was struck by the story of the nest box. The elements carved out such character, that its story had to be told. Did you know that it is a myth to take down your birdhouses for winter? Birds need protection. You should clean out the old nest, but leave the house up. Better yet, you can make or buy a roosting box and put it up for the winter. What is the difference between a birdhouse and roost box? The roosting box has the entrance hole near the bottom to conserve heat. It also can contain pegs inside for multiple birds to roost. Here is a link to an easy roosting box blueprint from the Washington Department of Fish & Wildlife, if you would like a nice weekend project. Lovey watercolor. Love the soft winter trees in the background. Thank you, Rose! Winter is one of my favorite seasons….after autumn! I keep seeing the birds look in the holes of my birdhouses, and then they come out pretty fast. I guess I need to clean their house. I’ve got enough trouble cleaning my own and now I’m cleaning birdhouses. Sheesh. This does have a lot of character. Thanks for the info on roosting box–a great idea.